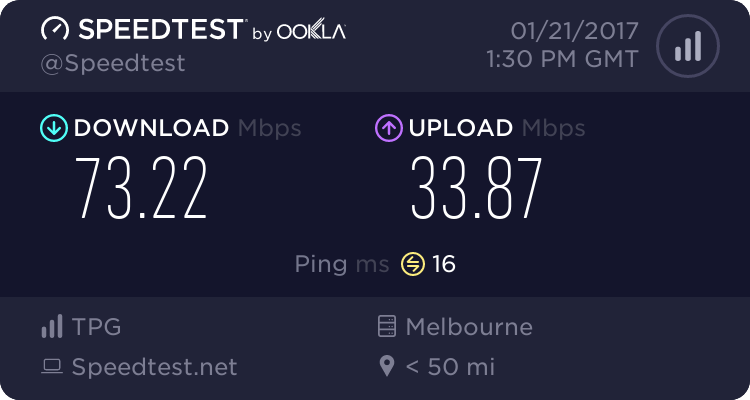 So I upgraded the connection type from VDSL to fiber optics. So I upgraded my internet connection type from VDSL to fiber optics. The previous was in the same package but due to the type of connection the ping was ~23ms, the upload speed couldn't be increased over 1mbps and frequent disconnections occurred. The upload speed here is 4mbps but it should be 1mbps as per the package and the rules. I was lucky enough that a good tech agreed to increase it for me. The price difference is only 27 US cents a month. Worth it for the higher upload speed and lower latency. Other than having the same package, now I can increase the speed to two more packages; a $67 USD 50mbps (has 10mbps UL speed and can upgrade it to 20mbps for $~14 USD) and a $107 USD 200mbps (has 80mbps UL speed). Those two packages have some services including free phone calls and premium TV channels. My current package is 20mbps for $54 USD. I honestly don't think I could really make a worthy good use of speeds higher than that at the moment. Maybe I would one day if I had to extend the connect for more people or files get much bigger than they are these days. VDSL supports a max of 100mbps DL but it deteriorates very quickly with distance and the lines are heavily affected by the surrounding. 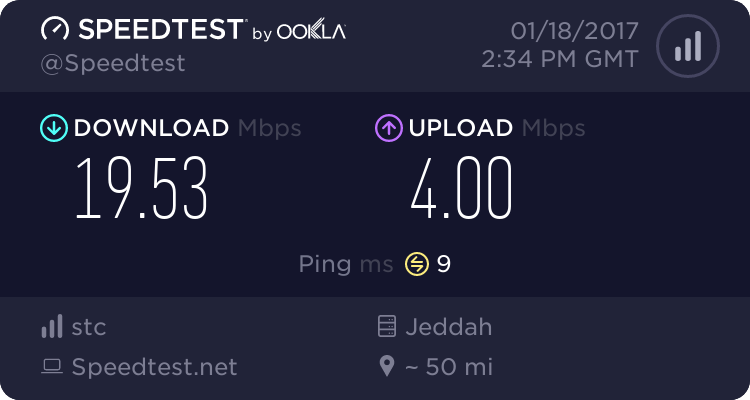 I couldn't get more than 40mbps in my previous connection and with heavy disconnections at best. Even the 20mbps I had sometimes went down to 19mbps. Let alone that the ISP's here only provided a max of 20mbps on VDSL. So forget about it. Re: So I upgraded the connection type from VDSL to fiber optics. We got gigabit service and I only pay 9.95 a month. Yeah, internet is expensive here, unfortunately. One thing I could think of is the bandwidth quota. Here in wired connections the speed is the only limit except for an economy package. The 20, 50 and 200mbps packages are unlimited. People download tons a day with no complaints or speed reduction. I once downloaded 80GB a day no problem. Sorry to hijack your post tSG..
No worries, feel right at home.